My latest contribution toward your goal of having better meetings. Think of any agenda topic as a conversation in which you are either expanding your ideas and options, or you are converging ideas in order to make a decision and take action. Productive conversations include both divergence and convergence. 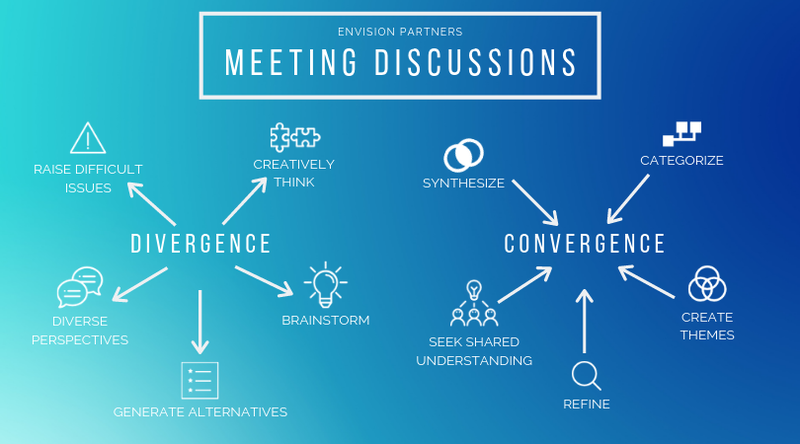 When planning an agenda topic for a meeting, build in time for both divergent and convergent discussions. Provide time for stakeholders to explore and share opinions and allow time to summarize these views toward a decision. These two types of discussions require different management styles. During divergence you want to be inclusive of everyone and all types ideas, expand on ideas and generate alternatives. During convergence you want to shift the discussion toward categorizing, summarizing, evaluating and testing agreement. When beginning a new agenda idea, state the desired outcome—what are you striving for? A decision, information gathering or a commitment. When diverging, encourage differences of opinions, ideas and options. Do not dive into each idea. Gain basic clarity and move on. Signal to the team when you sense there has been enough input and you are ready to start converging ideas. Go a little longer than you might be comfortable. Let there be silence. You control this meeting. Don’t be forced to move on. Make the transition from divergence to convergence known. Create categories and themes to simplify the list of options that have been created. Propose ways to synthesize by creating grouping parameters to help organize and reduce the number of ideas into like categories or themes. Discuss the reduced number of ideas or themes toward the originally stated goal. Test for decision, clarity, conclusions, agreement and commitment before closing the discussion of any one topic. Record and share meeting agreements and outcomes with everyone.